A gleaming new spacecraft valued at over $1 billion to serve in the top-notch mission of providing the president and military leaders a secure and survivable communications link in wartime was mounted atop its Atlas 5 rocket at Cape Canaveral today. 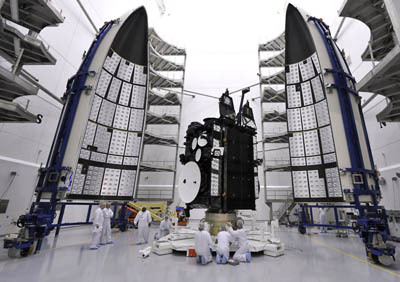 The second Advanced Extremely High Frequency satellite, AEHF 2, is scheduled for blastoff next week, Thursday, May 3, two days earlier than expected because the Eastern Range suddenly became available. The SpaceX Falcon 9 vehicle on its voyage to the International Space Station had planned to go during an instantaneous liftoff opportunity April 30, with a backup launch date of May 3 to rendezvous with the outpost. That drove the earliest Range slot for the Atlas to May 5. However, lingering problems forced SpaceX to again delay its long-awaited cargo-delivery demonstration trip to the station, scrapping any plans to launch next week and putting the Atlas first in line for blastoff from Cape Canaveral. The Air Force-controlled Range provides all of the necessary tracking, communications and safety services for Cape launches, and needs time in between flights to reset equipment in support of the next booster in the lineup. 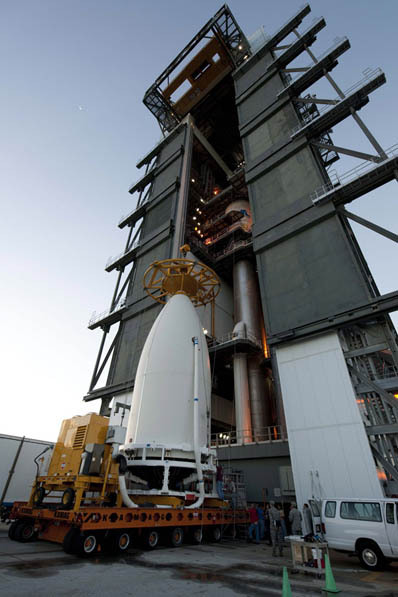 The Atlas launch window on May 3 extends from 2:46 to 4:46 p.m. EDT (1846-2046 GMT). But despite the uncertainty on exactly when the Atlas would take its aim at space, preparations have been progressing by the United Launch Alliance rocket team. Technicians today accomplished one of the key milestones left before liftoff when AEHF 2 took a middle-of-the-night road trip from the commercially-run Astrotech satellite processing campus in Titusville to the launch site aboard a trailer-like transporter. The slow-moving drive crossed the river, went northward through Kennedy Space Center, passed by the Vehicle Assembly Building and the old space shuttle launch pad before cruising down along the beach to the Atlas rocket's Vertical Integration Facility. AEHF 2's launch campaign at the Cape began when the craft was delivered Feb. 13 from Lockheed Martin's factory in Sunnyvale, California, arriving inside an Air Force transport aircraft. The shipping crate was taken to Astrotech where the craft was unboxed for final testing, loaded with maneuvering propellants and encapsulated in the rocket's nose cone. After pulling up to the doorway of the Vertical Integration Facility this morning, technicians went to work attaching the heavy-duty lifting sling to hoist the spacecraft in the bullet-shaped fairing off the ground and atop the Centaur upper stage. The United Launch Alliance-made rocket was assembled inside the VIF aboard a mobile launching platform over the past month. It was wheeled out to the launch pad one-third-of-a-mile away two weeks ago for a countdown dress rehearsal and fueling exercise before returning to the building to await the satellite installation. Mating of the payload to the rocket was underway this afternoon, followed by work to affix the nose cone's ogive section to the lower base of the fairing. Functional checks of the spacecraft and the combined systems test between AEHF and the Atlas vehicle will occur this week to verify the payload and rocket are talking to each other properly. The fully stacked rocket, now standing 196 feet tall, features a main stage fed with refined kerosene and liquid oxygen, three strap-on solid propellant boosters, the liquid hydrogen-powered cryogenic Centaur upper stage and a composite payload shroud 16 feet in diameter. Rollout to the pad for flight will occur the day prior to liftoff, leading to the 7-hour countdown sequence picking up on launch morning. It will take the Atlas just over 51 minutes to heave the cargo, weighing nearly 7 tons, into a highly elliptical supersynchronous transfer orbit with a high point of 31,070 statute miles, low point of 140 statute miles and inclination about 21 degrees to the equator. Controllers plan to spend 100 days or so using the craft's conventional and exotic electric propulsion systems to circularize the orbit 22,300 miles high and reduce inclination to 4.8 degrees for months-long testing in view of the U.S. The first AEHF satellite, launched in August 2010, suffered an accidental clogging of plumbing to its main engine, prompting a remarkable rescue using smaller thrusters to raise the craft into geosynchronous orbit. The upcoming craft has been thoroughly checked to ensure a repeat problem does not occur. Built in a collaboration between Lockheed Martin and Northrop Grumman, a series of AEHF spacecraft will replace the aging Milstar satellite fleet. They feature the highest levels of encryption, low probability of intercept and detection, jammer resistance and the ability to penetrate the electro-magnetic interference caused by nuclear weapons. AEHF was envisioned to keep communications flowing between the military and civilian leadership in any extreme wartime environment, giving the U.S. information superiority. Designers say one AEHF spacecraft has more capacity than the existing five-satellite Milstar constellation combined and its faster data rates will benefit tactical military communications, enabling higher quality maps, targeting data and live video to be transmitted without being detected by the enemy. Constructed around Lockheed Martin's A2100 satellite model with a 14-year life expectancy, the AEHF satellites feature power-generating solar panels stretching 89 feet tip-to-tip and two antenna-laden deployable wings. 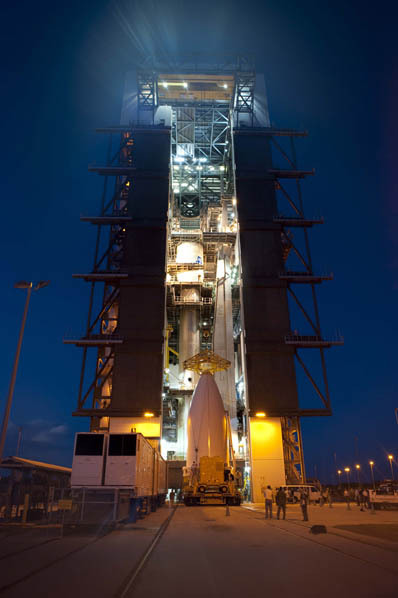 Next week's ascent will mark United Launch Alliance's 60th rocket flight since forming in 2006 and the 30th mission by the Atlas 5 in its decade-long history.